Think of Steve Bevilacqua’s new business venture as the ultimate do-over. Retired at 45, flush with success from the recent sale of his paving business (and having apparently fished the Chesapeake Bay and Gulf of Mexico dry), he reassessed his priorities and decided he’d had enough…of retirement. 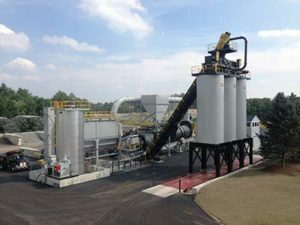 Armed with newfound enthusiasm and a desire to do some things differently this time around, he acquired a small parcel of land in Uxbridge, Mass., bought a 300-ton-per-hour (TPH) EX 10248 asphalt plant from Asphalt Drum Mixers (ADM) of Huntertown, Ind., and founded Bevilacqua Asphalt. Today, just months into the endeavor, he has established himself not just as a supplier of asphalt product, but also as a company that, through some unconventional approaches, is helping ensure the success of smaller and mid-size companies in the area. To see Bevilacqua’s new site is to witness efficiency. Set on a mere three acres, the operation effectively segregates traffic between the hot mix plant and the aggregate operation that supports it. Doing so ensures a smooth flow into and out of the new facility, according to company owner and president, Steve Bevilacqua. 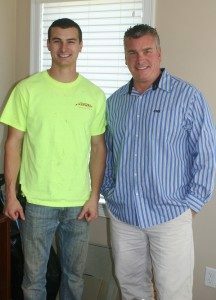 He said he learned a lot running his previous operation, Bevilacqua Paving which, after 15 years in business, had grown to be one of the largest and most in-demand companies in the area. Bevilacqua has distinguished himself from other asphalt companies by taking the traditional paver-to-supplier scenario—in which companies start out doing paving, then build an asphalt plant to meet their needs—and standing it on its head. 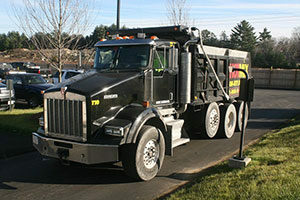 Hot Mix Onsite Delivery dedicated to delivering asphalt to companies that pave. Bevilacqua wanted to make certain that his company wasn’t seen as competing against those smaller companies and contractors, but would instead become the go-to resource for them. To ensure that, he also began offering paving equipment on a rental basis. The new approach was an uncertain commodity when Bevilacqua Asphalt opened its doors, but has since more than proven itself. Steve Bevilacqua says the paving equipment is almost continually out on rental and the Hot Mix Onsite Delivery trucks haven’t stopped moving since startup. Early on in the planning and decision making process, Bevilacqua says that he was looking at all the options available to him when choosing a plant, but ultimately chose ADM to provide the centerpiece of the new site. The 300 TPH plant in place at Uxbridge features an 8-foot 6-inch diameter by 48-foot long rotary drum; a 60,000 acfm baghouse; five 14-foot by 10-foot cold feed bins, each with a rated 30-ton capacity; two 30-ton recycle bins, three 150-ton silos with drag conveyor and transfer drags; and system controls that Bevilacqua mounted in his own control tower located one floor above his company offices. Bevilacqua will be the first to admit, given their status as a startup company and their new business focus, a 300-TPH plant was probably overkill. However, he said the reason for going that route was part unbridled optimism about future growth and part a lesson learned from his father. 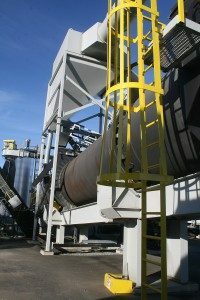 Looking at Bevilacqua’s operation, two things become immediately apparent: one is the overall cleanliness of the plant and its surroundings, the other is the aggregate supply bins which have canopies over them. To the first point, Bevilacqua says that he wanted to ensure that people looking at the plant would like what they saw. In addition to more than ¾ of an acre of grass, he planted more than $150,000 of mature trees and shrubs. Though it’s a bit early to tell, he said that between the coverings, the 100 million Btu/hr NovaStar Low NOx burner from Hauck Manufacturing Co., and the overall improved efficiency of the new ADM plant, he is seeing a significant reduction in fuel costs over that of his previous operation.